Spaghetti noodles tossed in a creamy sauce flavored with lemon juice, lemon zest, Parmesan cheese, garlic, and a little hit of crushed red pepper. The result is fresh, bright, and satisfying. 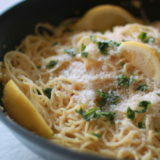 I adore this Lemon Spaghetti recipe, not only because it’s really good, but also because it comes together in a snap. It’s perfect for a quick weeknight dinner. Serve it up with a green salad and some nice crusty bread and your world is complete – for at least an hour or so. 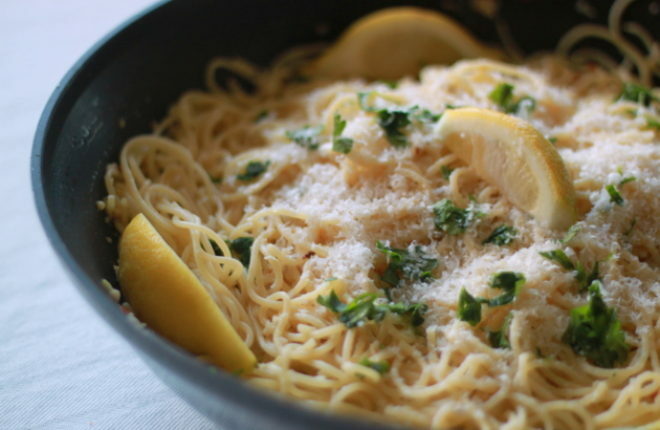 Lemon Spaghetti is a gorgeously simple dish. It’s spaghetti noodles tossed in a creamy sauce flavored with lemon juice, lemon zest, Parmesan, garlic, and a hit of crushed red pepper. Yes, it is unmistakenly lemony – so if you’re not a fan of lemon, I’d steer clear – but the salt, garlic, and crushed red pepper really round it out. I love this dish as a main (my resident carnivore even enjoys it) for lunch or dinner, but it would work equally well as a side, too. I think it’s perfect topped with parsley, but some strips of fresh basil instead (or in addition) would be terrific. Bring a large pot of water to a boil and add the spaghetti. Add salt to the water if desired. Heat a large deep skillet over low heat and add the olive oil, garlic, and crushed red pepper flakes. Cook for about five minutes, then add 3/4 cup of the water the pasta has been boiling in, along with the lemon juice and the heavy cream, to the skillet. Increase the heat to medium and bring to a boil, stirring frequently, until the sauce begins to thicken a bit. 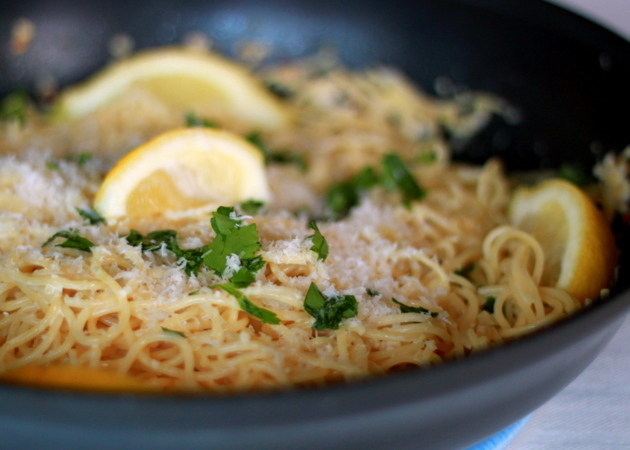 Add the lemon zest and half of the grated Parmesan cheese to the sauce. Add salt and pepper to taste. Drain the pasta and add it to the skillet with the sauce. Remove the skillet from the heat and, using tongs, toss the pasta with the sauce for a minute or two until the pasta begins to soak the sauce. Top with the remaining cheese and parsley. Serve. Parmesan is not vegetarian unfortunately! There actually are vegetarian Parmesan cheeses out there. I usually buy mine at Whole Foods. Do you need the heavy cream?